Once the BRIDGE is connected to your router and your Sonos wireless network is set up, you can add Sonos players wirelessly wherever you want music. Want to stream music to a remote location? 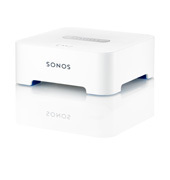 Just place a BRIDGE between two Sonos players to extend your wireless signal to reach the far corners of your home. If all of your Sonos players are in one location, you can put a BRIDGE in areas where the wireless coverage for your SONOS CONTROL needs an extra boost. The BRIDGE has a two-port Ethernet switch to bring standard Internet connectivity to your set-top box, DVR, PC, Game Console, or NAS drive.